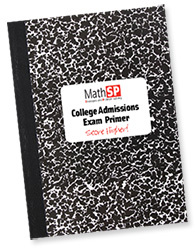 Download MathSP’s College Admission Exams Primer! Thank you for downloading the College Admission Exams Primer! Written by Stephanie Espy, founder of MathSP Tutoring and Test Prep and graduate of MIT, UC Berkeley, and Emory, the Primer will help you to develop a plan for exam success to ultimately get accepted into your target colleges! MathSP is the premier provider of tutoring and test preparation for students in middle school and beyond. We work with students to help them achieve superior results in academic subjects and on high school entrance, college entrance, and graduate school entrance exams. Learn how MathSP will help you succeed! We’re more than just math!